This paper focuses on an overview of radioactive cesium 137 (quasi-Cs137 included Cs134) contamination of freshwater fish in Fukushima and eastern Japan based on the data published by the Fisheries Agency of the Japanese Government in 2011. In the area north and west of the Fukushima Nuclear plant, freshwater fish have been highly contaminated. For example, the mean of active cesium (quasi-Cs137) contamination of Ayu (Plecoglossus altivelis) is 2,657 Bq/kg at Mano River, 20–40 km north-west from the plant. Bioaccumulation is observed in the Agano river basin in Aizu sub-region, 70–150 km west from the plant. 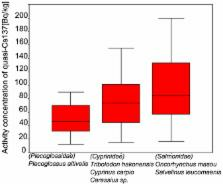 The active cesium (quasi-Cs137) contamination of carnivorous Salmondae is around 2 times higher than herbivorous Ayu. The extent of active cesium (quasi-Cs137) contamination of Ayu is observed in the entire eastern Japan. The some level of the contamination is recognized even in Shizuoka prefecture, 400 km south-west from the plant. Cutaneous malignant and premalignant conditions caused by chronic arsenicosis from contaminated ground water consumption: a profile of patients from eastern India. Radiocesium contamination of the web spider Nephila clavata (Nephilidae: Arachnida) 1.5 years after the Fukushima Dai-ichi Nuclear Power Plant accident.